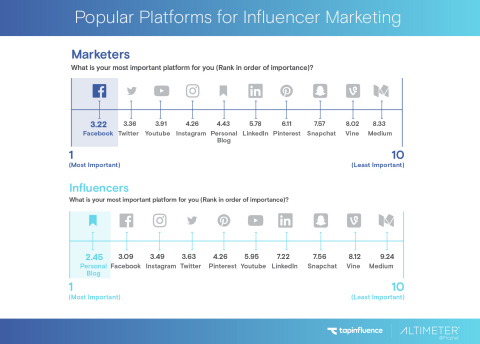 BOULDER, Colo. & SAN FRANCISCO--(BUSINESS WIRE)--TapInfluence, the only influencer marketing SaaS platform uniquely combined with a high-performing marketplace and a services offering, and Altimeter, a Prophet company, today released The Influencer Marketing Manifesto, an in-depth study of both marketers and influencers that uncovers how each party views social capital, the why, where and how of investments in influencer marketing, and what changes must take place to continue the category’s rapid growth. Resoundingly marketers feel influencer marketing is important as it creates more authentic brand storytelling. Additionally, the channel offers advanced targeting to consumers, greater ROI compared to other marketing channels, is a meaningful alternative to traditional ads and plugs brands into their digital communities, especially amongst millennials and centennials. 65% of companies spend less than $10,000 per influencer marketing campaign. 54% of marketers cite lack of assigned budget as an internal challenge towards greater adoption of influencer marketing, which likely stems in part from fragmented departmental ownership. 28% of brand respondents put ownership of influencer marketing under social marketing, however 16% put it under marketing communications and only 14% had a dedicated function. 56% cited internal concerns around influencer marketing being new and unproven as a challenge towards great investment. Data further showed a lack of alignment around what’s proven as effective with influencers and what budgets are actually going towards. 71% of marketers believe ongoing ambassadorship is the most effective form of influencer marketing, yet ambassadorships are a lesser used engagement type with influencers reporting that the number one request they get from brands is for sponsored content. 74% of brands are working directly with influencers (or their managers) on influencer marketing programs with 21% stating that they work with an agency to handle their programs. While brands succeed working directly with influencers 68% stated that finding relevant influencers was their greatest challenge in working in the field with finding ways that help them engage their communities while satisfying executive expectations and negotiating terms as the second and third most pervasive challenges. 34% of influencer marketing campaigns are between $0-$5,000 and only 7% of campaigns are over $100,000 with 14% of marketers paying influencers in product versus monetary compensation. For 55% of influencers, however, each engagement with a brand reaps them under $500. 22% receive between $500-$1,000 and only 8% make between $1,000-$5,000. As you can see, the value of a true influencer (versus a 6-figure celebrity) is modest. This presents an opportunity to build relationships early as many influencers are willing to work harder when they have an established, ongoing relationship with a brand. 72% of influencers state that brands offering inadequate compensation is the biggest mistake being made today. This highlights the difference in working with a social celebrity versus an everyday influencer. This is about impact. And impact isn’t just about potential impressions. Another interesting discrepancy and influencer frustration surrounds the emphasis and implied overvaluing of social shares. When asked to stack rank the most important platform for influencer content, marketers listed their top five as: Facebook, Twitter, YouTube, Instagram and then an influencer’s personal blog. On the flip side, influencers listed: personal blog, Facebook, Instagram, Twitter and Pinterest when asked the same question. Overvaluing social sharing is bothering influencers, many of whom have built their audience through their personal blogs. 38% of influencers surveyed stated that they consistently work with brands who pay them to reach their audience, another 40% stated that they sometimes do. Many online personalities and authorities are indeed recognized and compensated for their online presence when it comes to brand engagement. 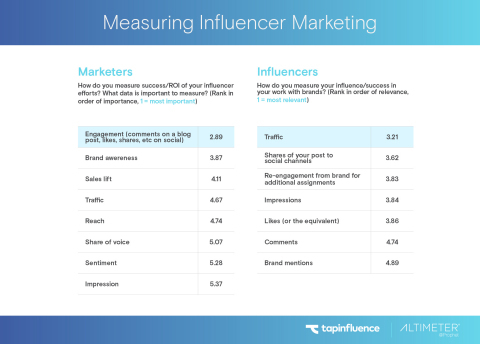 When asked to stack rank how they measure success/ROI of influencer efforts and data that they value, marketers’ top five responses include: engagement (comments, likes, shares, etc. ), brand awareness, sales lift, traffic and reach. Influencers presented with the same question answered: blog traffic, shares of their blog post to social, social likes (or the equivalent), getting re-hired by the same brand and impressions. Influencers evaluate success based on traffic as they don’t get the same transparency as brands do on other metrics that matter. But the ROI of influencer marketing can be vastly improved by first defining the “R” (return) as related to cause and effect against a current measured state. According to influencer marketers, it’s important to consider how well your brand, market, or product will resonate with a given influencer's audience. Marketers reported that they were more successful when working with influencers who are prolific on a variety of channels, as opposed to those who limit themselves to predominantly one platform or medium. When asked what audiences love most about their work, 71% of influencers stated that “I’m myself, honest, funny, open, and willing to call it like I see it” as the number one reason. The second and third most popular responses were: That I provide value by addressing the things that they are interested in and that I interact with them, listen and respond online. Yet when asked to stack rank the biggest mistakes brands were making when working with influencers, the responses following compensation included: overly restrictive content guidelines, not providing adequate time and requiring too many social shares or sharing to every social channel. 41% of marketers responded that lack of control over messaging was a challenge to further investment, marking a clear misalignment between the two parties. Brands want to control messaging and content, and influencers feel that marketers are already too controlling. Influencers are powerful because of their authenticity, and, as aforementioned, brands put “more authentic storytelling for our brand” as the top reason why they believe influencer marketing is important. Clearly, controlling the message is counterproductive to the ultimate business goal and influencers are frustrated. Download a free copy of The Influencer Marketing Manifesto here. This study was commissioned by TapInfluence to understand the current state of influencer marketing. Research was conducted by Altimeter using an anonymous online questionnaire between February 26, 2016 and April 29, 2016. In total, 1,753 influencers and 102 marketers responded. TapInfluence’s complete SaaS platform, coupled with an engaged influencer marketplace and strategic services, is the leading solution facilitating real conversations between consumers and brands. The company enables Fortune 1000 brands to tap into the power of digital influencers and their authentic, trusted voices. With its influencer marketing automation platform, TapInfluence customers increase market share and amplify revenue growth through scalable reach and optimized engagement to achieve unprecedented ROI. In a recent independent study, TapInfluence proved that influencer marketing drives 11x the return on investment annually versus any other form of digital media. TapInfluence’s Fortune 1000 customers include Kraft, Horizon Organic, Silk, and P&G, as well as top agencies such as Golin, RhythmOne and AMP. TapInfluence is privately held, with headquarters in Boulder, Colo. and Mountain View, Calif. The company is backed by leading venture capital firms Noro-Moseley Partners, Grotech Ventures, Access Venture Partners and Knollwood Investment Advisory. For more information, visit www.tapinfluence.com. Altimeter, a Prophet company, is a research and strategy consulting firm that helps companies understand and act on disruption. In July 2015, Prophet acquired Altimeter Group, to bring together forward-thinking digital research and consultancy under one umbrella to help clients unlock digital transformations. Altimeter was founded in 2008 by best-selling author Charlene Li, focusing research in digital transformation, social business and governance, customer experience, big data, and the Internet of Things. Altimeter is based in San Francisco, CA. For more information visit http://www.altimetergroup.com.